Rector Ralf Hemmingsen has followed the recommendation of a unanimous nominating committee by appointing Professor Jacob Graff Nielsen as Dean of the Faculty of Law at University of Copenhagen. Professor Jacob Graff Nielsen will take over as Dean of the Faculty of Law from 1 April and will be responsible for managing and developing the Faculty. Professor Jacob Graff Nielsen has been appointed Dean of the Faculty of Law for a five year period from 1 April 2014. “I am extremely pleased that the University of Copenhagen can appoint Jacob Graff Nielsen as the new Dean of the Faculty of Law. He has considerable insight into the functioning of the faculty and a broad perspective of the challenges facing the faculty and the possible solutions to them,” says Rector Ralf Hemmingsen. Reporting to the Rector, Jacob Graff Nielsen will be responsible for managing and developing the Faculty of Law which is undergoing an important period of change. Key issues include the current reform of the legal study programme, the further development of the Faculty’s research centres, utilisation of experience gathered by the Faculty’s first pure research centre and preparation of the Faculty’s move to the University’s South Campus. Jacob Graff Nielsen is 42 years old. Since gaining his PhD in 2003 for research into ‘Legality Requirements in Taxation’ he has been employed at the Faculty of Law as lecturer, assistant professor, senior associate professor and, since 2011, professor in Tax Law. The newly appointed Dean has worked with research management since 2006, first as Head of Department, then as Director of the PhD School and now as Director of Research at the Faculty of Law. As Director of Research, Jacob Graff Nielsen is the manager of all scientific personnel, except the PhD students, is responsible for the research area’s budget and has acquired considerable experience in assessing researchers and research projects both in and outside Denmark. 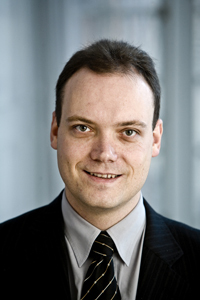 Parallel with his other responsibilities, Jacob Graff Nielsen has occupied a number of positions at University of Copenhagen including membership of the University’s Research Education Committee (KUFUR) as well as the Faculty’s Academic Council, Collaboration Committee and Advisory Board. Internationally, the new Dean is a member of the Academic Committee of the European Association of Tax Law Professors. It is a unanimous nominating committee composed of students, employees and Prorector Lykke Friis that are behind Rector Ralf Hemmingsen’s choice of Jacob Graff Nielsen. Jacob Graff Nielsen replaces Professor Jørn Vestergaard, who has been Acting Dean since February when the previous Dean, Henrik Dam, left to take up the position of Rector at the University of Southern Denmark.